St. Patrick’s Day is pretty much just an excuse for me to bake up a few “normal” treats and turn them into rainbow treats. 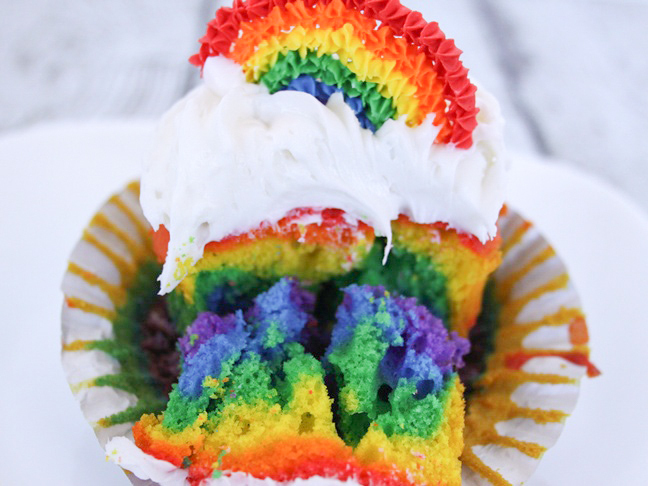 Rainbow cakes look incredibly stunning, but they’re somewhat fussy to make. 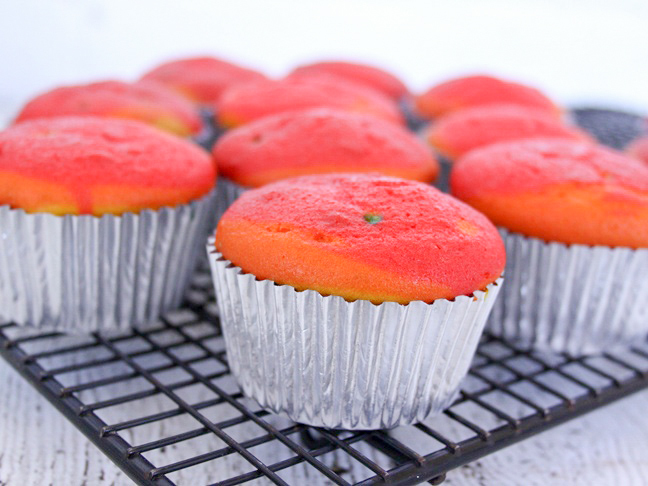 These rainbow cupcakes take a little more effort than plain ol’ vanilla cupcakes, but the results are so fun and stunning that they’re definitely worth the few extra steps. 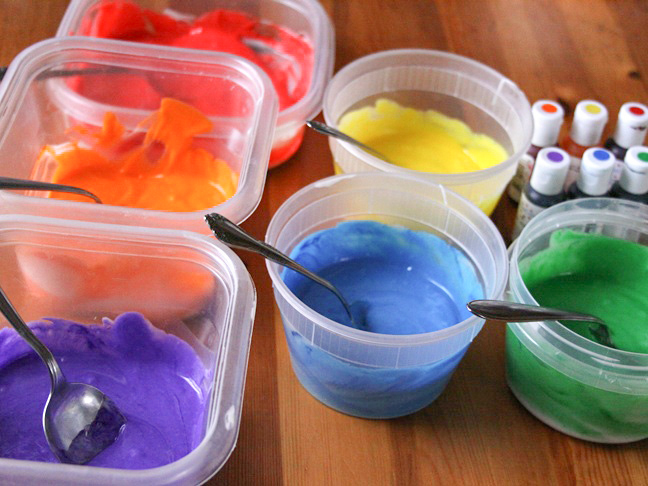 Step 1: A day or so before you plan to make the cupcakes, make the rainbow toppers by mixing up the royal icing (adapted from Wilton). Mix together 4 cups powdered sugar with 3 tablespoons meringue powder, and slowly add the water while mixing on low speed until the icing is the desired consistency. You’re looking for a stiff icing that holds its shape. Step 3: Add the Wilton # 15 tip to the end of a pastry bag, and fill the bag with the red royal icing. 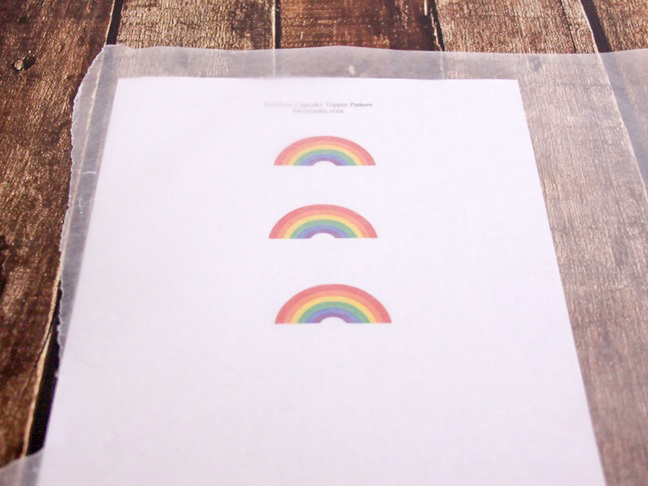 Step 4: Print out the rainbow pattern and place a piece of wax paper over the top. Step 5: Make a row of red stars on the wax paper over the top of the red color in the rainbow pattern, and repeat the process to make as many toppers as you need. 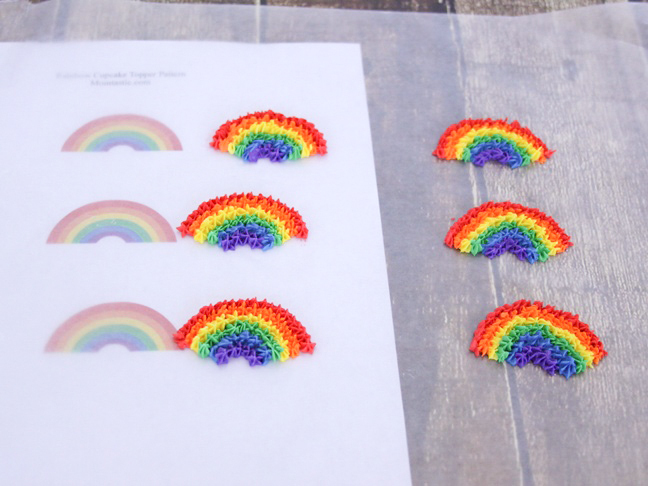 You can move the pattern around to make more rainbows. Step 6: Move the Wilton #15 tip to a new pastry bag and repeat the process with the orange royal icing, using it to put a row of orange stars just beneath the red stars to match up to the rainbow pattern. Step 7: Repeat the process until you’ve done all of the colors of the rainbow. 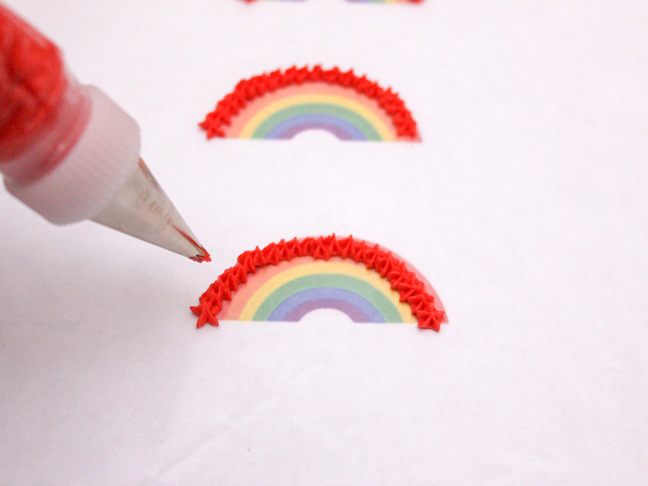 Step 8: Set your royal icing rainbows aside to dry for about a day, and the toppers will become hard, like sugar candy. Step 9: On the day you’re ready to make the cupcakes, preheat the oven and mix up the cake batter according to package directions. Make sure you use egg whites, not whole eggs, to keep the batter white and really make your rainbow colors pop. Step 10: Divide the batter into 6 medium bowls. Use a measuring cup to make sure you get the same amount of batter in each bowl. The cake mix should yield about ¾ cup of batter for each bowl. Step 12: For each bowl, mix up the batter and check the color. 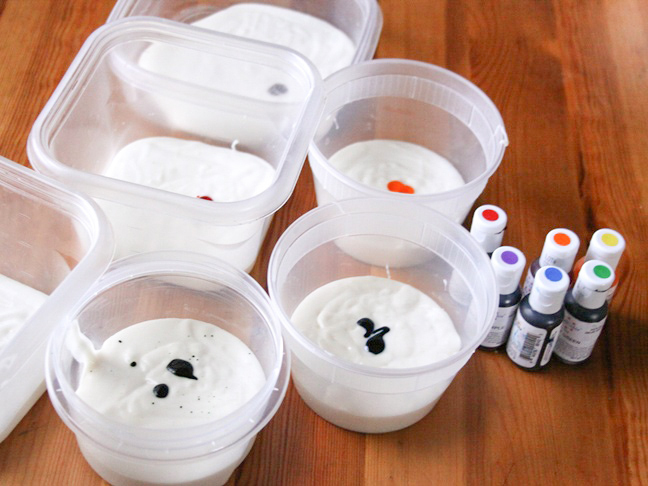 If the color is not bright enough, add a drop or two more of food coloring and mix until the batter reaches the desired color. Step 13: Line a cupcake tin or two with cupcake liners. 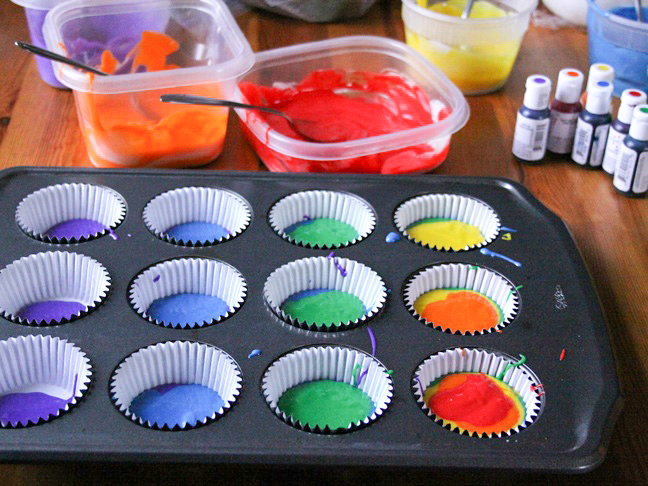 Add the batter one teaspoon at a time, starting with purple on the bottom of each liner, and then add a teaspoon of blue, green, yellow, orange, and red to each cupcake liner. You should end up with each cup about ⅔ full. Step 14: Bake the cupcakes according to the package directions. Step 15: When the cupcakes are finished baking, turn them out onto a cooling rack to cool completely. 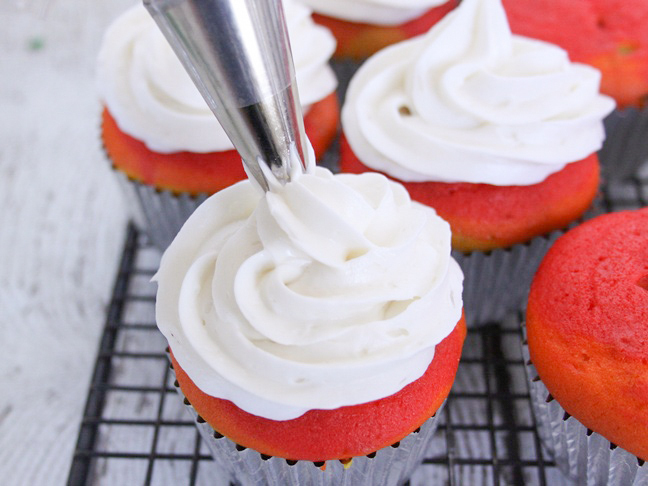 Step 16: While the cupcakes are baking and cooling, mix up the buttercream icing. To make the buttercream icing, mix together cream cheese, 6 cups of powdered sugar, and about 6 teaspoons of water in an extra large mixing bowl. Blend until the icing holds its shape. If the icing is too thin, add a little more confectioner's sugar; if the icing is too stiff, add a little more water, one teaspoon at a time. The icing should hold its shape when you're done but shouldn't be too stiff. Step 17: Add a Wilton #1M or another large tip to the end of a pastry bag, and fill the bag about ¾ full with cream cheese icing. Step 18: Use the decorator tip to swirl icing on top of the cupcake and around from the outside in, forming a peak in the center. 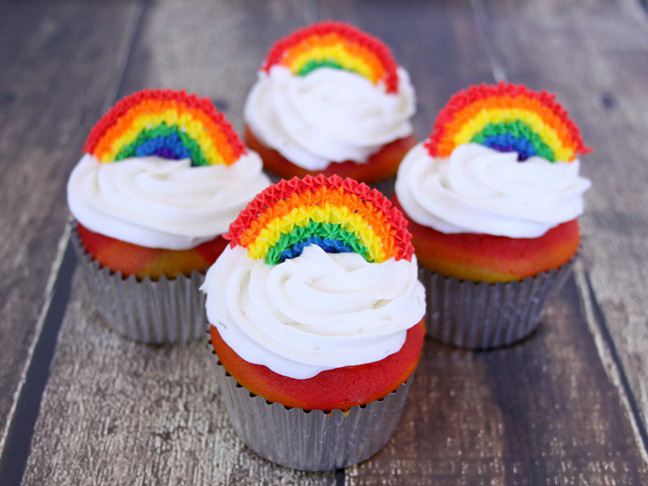 Step 19: Add a rainbow topper to the top of each cupcake, and you’re ready to serve!